On July 15th, Super Junior released their Japanese Special Edition album of “Sorry Sorry” and it debuted at Number 12 on the Oricon Daily Chart. Super Junior has proof of their popularity and it comes in the form of album sales! As of the 15th, the 13 member idol group has sold over 200,000 copies albums–setting a record for themselves. After they released their 3rd album ‘Sorry Sorry’ on March 12th, they’ve sold 75,319 albums online and 139,851 albums offline. Added all together, it comes up to a total of 215,170 albums. In two months, they’ve surpassed the amount of sales for their 2nd album back in 2007 (that album sold 190,000). It isn’t just the best-selling album in Korea though, it’s been number one on album sale charts in countries such as Taiwan and Thailand. In the past two years, excluding DBSK, Super Junior is the only group to have sold over 200,000 albums. Just when I thought SJ has ended promoting Sorry Sorry! Some ajhusshis from a supposedly Korean Airline (their venue) made a parody on “Sorry Sorry”. And damn they could dance well! LOL this is really entertaining! Super Junior have done it again as they claimed the K-Chart on KBS2TV Music Bank for the 4th week running with Sorry, Sorry. The win today was their 5th K-Chart win, taking into account their 2 monthly and 3 weekly wins. The contenders for the 15th May episode of Music Bank were the same from last week as SG Wannabe’s I Love You, 2PM’s Again & Again and Super Junior’s Sorry, Sorry faced each other again. Although SG Wannabe were present this time, they were equally powerless like 2PM as Super Junior walked away with another win. Breakdown of the new K-Chart ranking system (many thanks to stellarremnants). 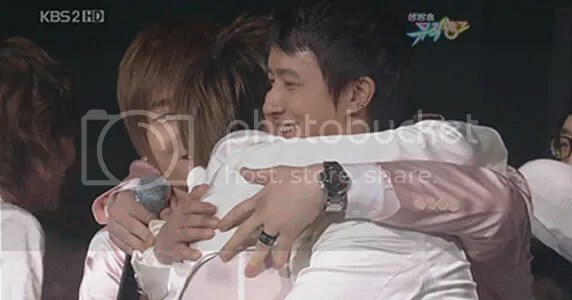 Lee Teuk was in tears as he thanked their boss, Lee Soo Man since it was Teacher’s Day in Korea. Super Junior’s new song “It’s You” is leaked!! Super Junior Wins K-Chart Once Again! After 2 monthly and a weekly K-Chart win, Super Junior won for the 3rd week in a row on KBS2TV Music Bank on the 8th May episode. The contenders for number 1 on K-Chart were SG Wannabe’s (did not perform) I Love You, 2PM’s Again & Again and Super Junior’s Sorry, Sorry. Super Junior eventually came away as the winners again with 8,055 points. It was great to see Super Junior present this time to receive the award after being absent last week because of an appointment in China. They said in their winning speech that they were just working hard to deliver their song and give a great performance and did not really anticipate anything. Seeing that it was Parent’s Day today, they also took the opportunity to dedicate this win to the parents of all 13 members. Super Junior will stop their Sorry, Sorry promotions soon and start promoting their new song It’s You from 17th May onwards from their repackaged album.